Hexachords Orb Composer Artist S is a unique music composition software that uses Artificial Intelligence (A.I.) to help musicians, composers, producers, or simply beginners unleash their creativity and quickly experiment with new musical concepts. Before writing a single note, think of music in terms of ideas, intentions, and emotions. The software then helps you transform these musical ideas into a fully organized composition, assisting you every step of the way, but without imposing choices and always giving you complete control over the process. 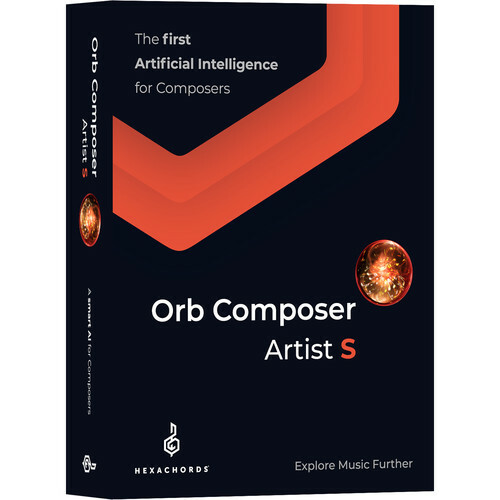 Orb Composer Artist S is compatible with all MIDI devices and can be used as a standalone or within your DAW. A simple and intuitive interface provides a friendly workspace for designing a complete musical environment that suits the style of your composition. The software lets you choose from four musical templates, add as many music blocks as you wish (each with its own simple or complex structure), and build your own chord progressions with the chords provided in the library. Choose your own instrumentation or let the A.I. engine propose a choice of instruments based on curves that affect the intensity and momentum of the notes within your composition. For sounds you can use your own VST instruments or hardware synths. You can also import your own melody via MIDI files or let Orb compose one for you. Packed with A.I.-driven features, Orb Composer Artist S provides you with a fast workflow that speeds up the composition process. It gives you more time to experiment and be creative, while still being able to meet strict deadlines when working on TV, films, games, and radio projects. Orb Composer Artist S - Music Composition Software (Download) is rated 1.0 out of 5 by 1. Rated 1 out of 5 by Stephen from Crashes constantly The company does not provide refunds if you buy from them directly (in violation of EU law) and the software is so glitchy and buggy that its virtually unusable.